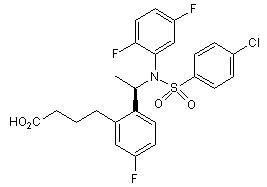 PF-3084014 is a reversible, noncompetitive, and selective γ-secretase inhibitor with IC50 of 6.2 nM. LY900009 is a small molecule inhibitor of Notch signalling via selective inhibition of the γ-secretase protein. BMS-299897 markedly reduced both brain and plasma Abeta in APP-YAC mice with ED(50) values of 86 and 22 mg/kg per os (po), respectively. 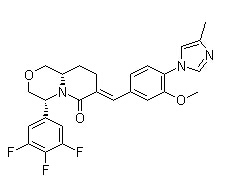 Gamma-Secretase Modulators (Amyloid-β production inhibitor) is a Amyloid-β production inhibitor. Gamma-Secretase Modulators is useful for Alzheimer's disease. NGP555 is a γ-secretase modulator. L685458 is a potent and selective γ -secretase inhibitor (IC50 = 17 nM) that displays > 50-fold selectivity over a range of aspartyl, serine and cysteine proteases. 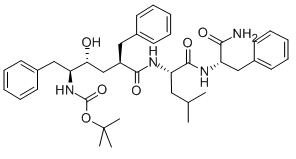 L685458 also exhibits equal potency for inhibition of A β 40 and A β 42 peptides (IC50 values are 48 and 67 nM respectively in human neuroblastoma cells). Also regulates CXCR4 and VEGFR2 expression through inhibition of Notch signaling in vitro. γ-Secretase Inhibitor XXI, Compound E is a cell-permeable, potent, selective, peptidomimetic, non-transition-state analog inhibitor of γ-secretase and Notch processing (IC50 = 300 pM for Aβ40 in CHO cells overexpressing wild type βAPP. MK-0752 is a moderately potent γ-secretase inhibitor, which reduces Aβ40 production with IC50 of 5 nM.